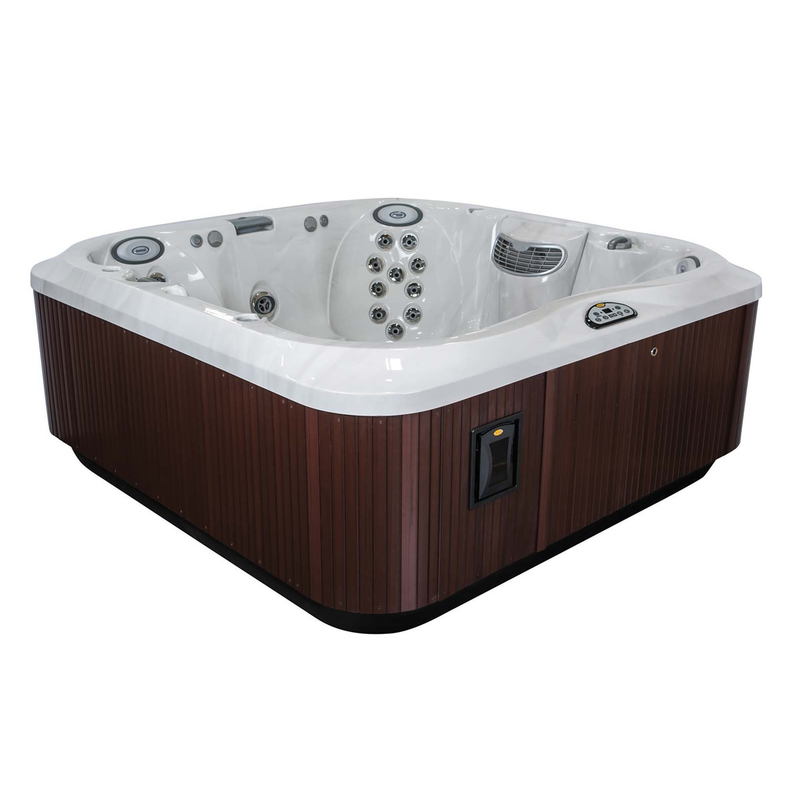 The J-375IP™ is a luxurious hot tub with a wide range of features. It’s the go-to-model if you’re looking for a luxuriously large portable hot tub with Jacuzzi®’s most desirable features. 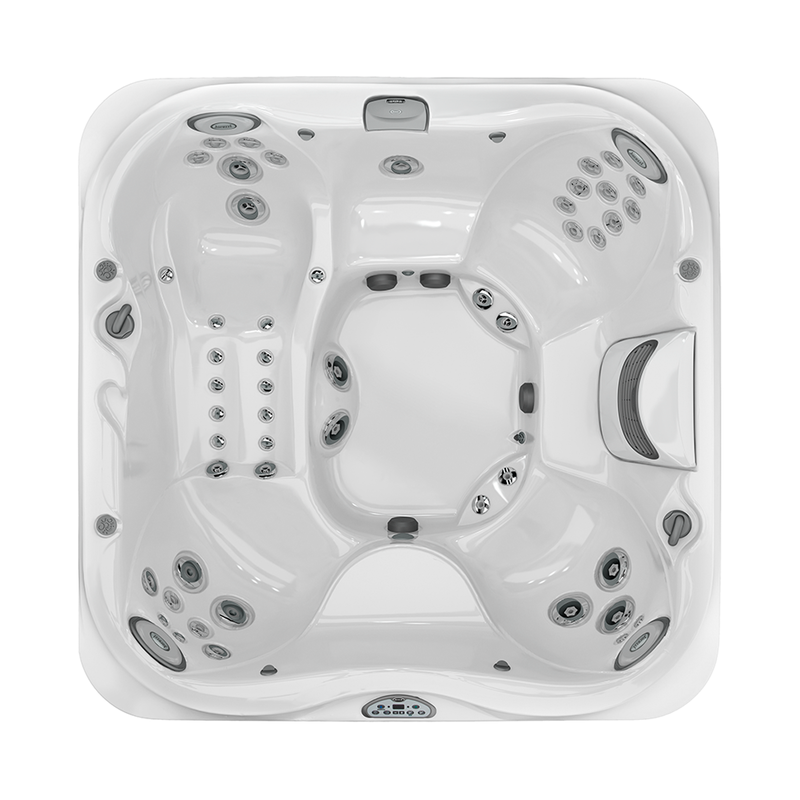 The Jacuzzi® J-375IP™ Hot Tub offers room for up to six adults to fit comfortably. The tension-reducing PowerPro® Therapy Seat, lounge seating, and superior PowerPro® Jets, including FX Jets, provide a hydrotherapy haven for your mind and body and will melt away stress. The PowerPro BX “bubbler” jets provide an effervescent, tension-relieving massage to the calf muscles, while the PowerPro MX jets deliver deep-tissue rejuvenation to soothe tired back muscles. The ProPolymer Foundation protects the structure from the elements, making the J-375IP™ built to withstand the heat or the cold and offering year-round use and it is built to last for prolonged enjoyment. Enjoy the calming effect of the Water Rainbow® waterfall, illuminated cup holders and enhanced LED lighting and illumination throughout that induces visual stimulation. One of the greatest luxuries of owning a portable Jacuzzi® hot tub is the wealth of options available for personalized features. Warranted against water loss due to defects in the spa shell for up to ten years from the original date of purchase. Excludes cover. Warranted against blistering, cracking, or delaminating of the interior spa surface for seven years from the original date of purchase. Plumbing components are warranted against leaks due to defects in workmanship or materials for five years from original purchase. Jacuzzi® spas’ electrical equipment components are warranted against malfunctions due to defects in workmanship or materials for five years from the original date of purchase. Excludes ClearRAY™. Jacuzzi® hot tub cover and panels are warranted against defects in workmanship or materials for five years from the original date of purchase. Normal wear and weathering of the finish will occur naturally over time, and are not defects. Excludes bulbs. Warranty 90 days. Targets the neck, shoulders and back, while adjustable jets pinpoint problematic areas and relieve pain and tension. Utilizes PowerPro® Jets to stimulate surrounding tissue and release muscle knots with spiraling, pulsating jets in the mid back. This positions your body for the ideal hydromassage, deep tissue muscle knot relief in the back and tension release for the neck. More room for full-body tension relief, adjustable jets ease tension, including small, targeted, large, rotational and comforting jets. © 2019 Wensum Pools | All Rights Reserved.